A Fit Kit consists of a pair of Intuition socks and flexible toe caps. Put the caps over your toes and insole, and then slide the whole setup into the socks. They are now ready to mold and will give your toes some space to breathe, which is key when skinning uphill. This DIY kit can be used at home if you’re brave enough to heat your own liners, either in an oven or with a bag of hot rice. Click here for instructions from Intuition. The Fit Kits are available in two sizes, with the rubber toe caps varying in width and depth. The Small works best with mondo sizes 22-27.5, while the Large is designed for size 28+. There is some grey area around 27.5/28, especially with race boots that use different shell sizing than most alpine boots. Likely either will work just fine for you. For many years I molded liners using toe caps improvised from a wide variety of materials. Then I ended up with this Intuition Fit Kit from a friend's liners. 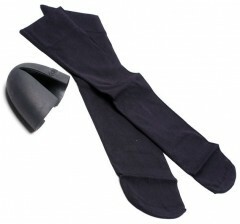 The toe cap design is especially clever with the split that allows for a big range of foot sizes and shapes. The material won't compress at all, and therefore effectively compresses the liner's toe box foam to create enough room for your toes. The socks are nothing special, although they are more durable (and less embarrassing) than my previous practice of using women's nylons.